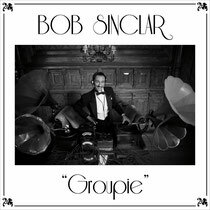 Parisian pop star and international DJ Bob Sinclar transforms into a star of the silent movies for his new release ‘Groupie’. Emulating the legends of the silver screen, Charlie Chaplin, Buster Keaton and Greta Garbo, Bob Sinclar travels back in time to the 1920s in the video that takes its inspiration from the classic French movie ‘The Artist’. ‘Groupie’ is a signature Bob Sinclar track and has all the elements you would expect from the Parisian. Featuring big piano riffs and cheeky female vocals mixed with big bass and dance beats, the outcome has more than a little of the Charleston sound about it. In the new video, Bob Sinclar shows off his newly acquired skills for Tap and Ballroom dancing, which he spent four months perfecting. Check out his specially designed double gramophone mixing contraption for extra authenticity. The track is already a hit in France and with over three million YouTube views in one month.